Liberty is known for their heavy duty safes. They offer safes for residential and commercial use with more than twenty-two gun safes. The following are a couple of Liberty gun safe reviews that will help you decide whether this is the company for you to look further into. They may be the largest producers of gun safes but is it worth buying their products? The company was founded in 1988 and has made their name well-known in the industry by providing some of the highest quality safes. You can see the BTU rating on the Liberty Safe you are interested in before dishing out the money. You can also check out how long they will withstand temperatures and how hot of temperatures the safe can withstand without your valuables being harmed. Some safe companies claim that they have fireproof safes but their safes do not meet the standards of a Liberty Safe. In order for the safe to be completely fireproof the seal and door bolts cannot be weak. Many fireproof safes will allow smoke to enter the safe when the fire reaches a certain temperature and the bolts won’t keep the door in place causing the door to bend a little also allowing smoke and heat to enter the safe. You do not have to worry about this with a Liberty Safe. This is a tough entry level safe with a twelve gun capacity. This entry level safe is stronger than other entry level safes on the market. It will withstand a fire for up to thirty minutes. The inside of the safe is lined with carpet so your guns will not get damaged by the steel. 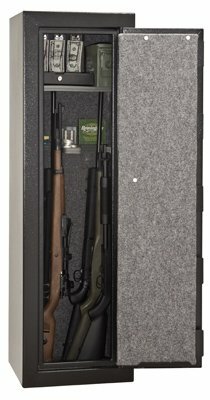 It is equipped with a shelf at the top so you can store ammunition, handguns, or any valuables you want to keep protected. You also get a lifetime warranty on the Liberty Revolution Gun Safe. The door seal expands so heat or smoke cannot enter the safe keeping the contents protected from any fire damage for up to thirty minutes. The locking bars are military style. The lock has a steel plate behind it making it impossible for a thief to drill the lockout and gain access to your safe. The door opens 180 degrees making it easier for you to access the safe. Anti-break hinges make it impossible to pry the safe open. There are one hundred numbers on the dial. You cannot be a half a number off because it will keep the door from opening. It might take a few tries before you can open the safe on the first try. This safe will not hold twelve guns if they have scopes on them. This is a larger gun safe but has some of the same features as the Liberty Revolution. The safe can withstand heat up to 1200 degrees Fahrenheit for thirty minutes. It is equipped with ten military-style locking bolts making it impossible for a thief to pry open the door to gain access. If that doesn’t make you more comfortable about the protection this gun safe offers you will like the fact that it is also equipped with a hard plate made of steel making it impossible to drill into the safe to gain access. Like many other safes, this Safe has pre-drilled holes so it will be easier to anchor the safe to the floor. The hardware to anchor the safe to the floor is not included. The inside of the safe is lined with carpet to prevent your guns from being damaged by the steel. 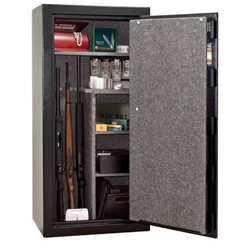 Equipped with a carpeted shelf for your small valuables, handguns, or ammunition. There is an option to have a light installed in the safe. The safe is small so it can be placed in tighter spots than most of the other safes on the market. The safe is under 400 pounds making it easier for you to relocate the safe in the future. The safe will not hold twenty-four guns if they are mounted with scopes. The shelf is a little flimsy so you cannot store much ammunition on it. The dial will feel a little stiff at first. It should loosen up more after a few times of use. You cannot remove the shelves like you can on many other safes. Liberty Gun Safes are entry-level safes. They are constructed of hard steel with excellent craftsmanship. These safes are cheaper than others on the market that has some of the same features. See how Liberty Gun Safes compare to our list of the best gun safes under 1000$. Liberty Gun Safes are cheaper than top of the line safes, but they have some better features that will protect your valuables or guns from fire or burglar.If you have a gun collection or need somewhere to lock your valuables, a Liberty Safe is something you should look into. They have features that are unique from other safes such as the military-style locking bolts and anti-break hinges. There are new Liberty Gun Safe reviews to be added by Shooting and Safety editors. If you are into small safes, just have a look at our top 10 gun safe reviews section here on this website. Feel free to comment below to ask any additional information!